Sarah Stewart is living her ideal life—and it just got sweeter. 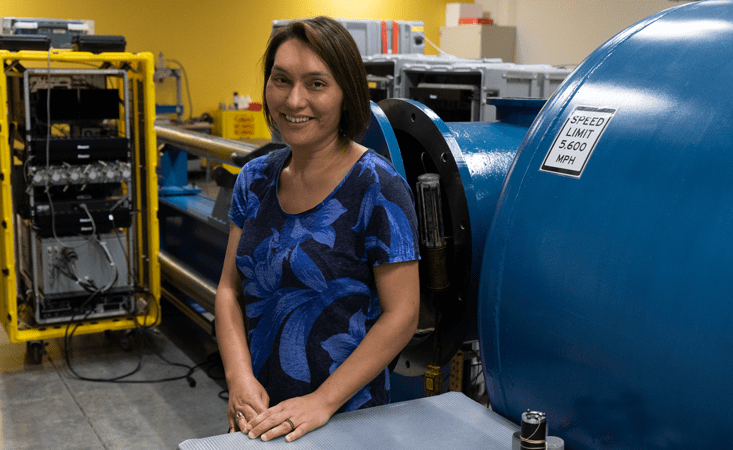 The University of California, Davis planetary physicist recently won a MacArthur Foundation Fellowship, famously and unofficially known as the “genius grant,” for her work on the origin of Earth’s moon, upending a decades-old theory. She’s been awarded $625,000. Nautilus spoke to Stewart during World Space Week, the theme of which, this year, is “Space Unites the World.” It compelled her to pen a poem, using the theme as a title. Nautilus asked Stewart about that, as well as how her laboratory experiments, which replicate the pressures and temperatures of planetary collisions, informed her model of the moon’s birth. How can space bring us together? This World Space Week is happening at a time where the world seems to be highlighting divisions. And so I wrote what I wrote as a response to that. Space exploration and discovery of things that are surprising and new is a way to bring everyone together, and enjoy the profound beauty of nature. And I would like us to spend more time talking about the things that bring us together. Like the moon. Give us a brief history of its origin theories. Next year, 2019, is the 50th anniversary of the Apollo moon landing. The rock samples that the Apollo missions brought back basically threw out every previous idea for the origin of the moon. Before the Apollo results were in, a Russian astronomer named Viktor Safronov had been developing models of how planets grow. He found that they grow into these sub- or proto-planet-size bodies that would then collide. A couple of different groups then independently proposed that a giant impact made a disc around the Earth that the moon accreted from. Over the past 50 years, that model became quantitative, predictive. Simulations showed that the moon should be made primarily out of the object that struck the proto-Earth. But the Apollo mission found that the moon is practically a twin of the Earth, particularly its mantle, in major elements and in isotopic ratios: The different weight elements are like fingerprints, present in the same abundances. Every single small asteroid and planet in the solar system has a different fingerprint, except the Earth and the moon. So the giant impact hypothesis was wrong. It’s a lesson in how science works—the giant impact hypothesis hung on for so long because there was no alternative model that hadn’t already been disproven. How is your proposal for the moon’s birth different? We changed the giant impact. And by changing it we specifically removed one of the original constraints. The original giant impact was proposed to set the length of day of the Earth, because angular momentum—the rotational equivalent of linear momentum—is a physical quantity that is conserved: If we go backward in time, the moon comes closer to the Earth. At the time the moon grew, the Earth would have been spinning with a five-hour day. So all of the giant impact models were tuned to give us a five-hour day for the Earth right after the giant impact. What we did was say, “Well, what if there were a way to change the angular momentum after the moon formed?” That would have to be through a dynamical interaction with the sun. What that means is that we could start the Earth spinning much faster—we were exploring models where the Earth had a two- to three-hour day after the giant impact. What did a faster-spinning Earth do to your models? The surprising new thing is that when the Earth is hot, vaporized, and spinning quickly, it isn’t a planet anymore. There’s a boundary beyond which all of the Earth material cannot physically stay in an object that rotates altogether—we call that the co-rotation limit. A body that exceeds the co-rotation limit forms a new object that we named a synestia, a Greek-derived word that is meant to represent a connected structure. A synestia is a different object than a planet plus a disc. It has different internal dynamics. In this hot vaporized state, the hot gas in the disc can’t fall onto the planet, because the planet has an atmosphere that’s pushing that gas out. What ends up happening is that the rock vapor that forms a synestia cools by radiating to space, forms magma rain in the outer parts of the synestia, and that magma rain accretes to form the moon within the rock vapor that later cools to become the Earth. How did the idea of a synestia come about? In 2012, Matija Ćuk and I published a paper that was a high-spin model for the origin of the moon. We changed the impact event, but we didn’t realize that after the impact, things were completely different. It just wasn’t anything we ever extracted from the simulations. It wasn’t until two years later when my student Simon Lock and I were looking at different plots, plots we had never made before out of the same simulations, that we realized that we had been interpreting what happened next incorrectly. There was a bonafide eureka moment where we’re sitting together talking about how the disc would evolve around the Earth after the impact, and realizing that it wasn’t a standard disc. These synestias have probably been sitting in people’s computer systems for quite some time without anyone ever actually identifying them as something different. Was the size of the synestia beyond the moon’s current orbit? It could have been bigger. Exactly how big it was depends on the energy of the event and how fast it was spinning. We don’t have precise constraints on that to make the moon because a range of synestias could make the moon. How long was the Earth in a synestia state? The synestia was very large, but it didn’t last very long. Because rock vapor is very hot, and where we are in the solar system is far enough away from the sun that our mean temperature is cooler than rock vapor, the synestia cooled very quickly. So it could last 1,000 years or so before looking like a normal planet again. Exactly how long it lasts depends on what else is happening in the solar system around the Earth. In order to be a long lived object it would need to be very close to the star. What was the size of the object that struck proto-Earth? We can’t tell, because a variety of mass ratios, impact angles, impact velocities can make a synestia that has enough mass and angular momentum in it to make our moon. I don’t know that we will ever know for sure exactly what hit us. There may be ways for us to constrain the possibilities. One way to do that is to look deep in the Earth for clues about how large the event could have been. There are chemical tracers from the deep mantle that indicate that the Earth wasn’t completely melted and mixed, even by the moon-forming event. Those reach the surface through what are called ocean island basalts, sometimes called mantle plumes, from near the core-mantle boundary, up through the whole mantle to the surface. It could be that that could be used as a constraint on being too big. Because the Earth and the moon are very similar in the mantles of the two bodies, that can be used to determine what is too small of an event. That would give us a range that can probably be satisfied by a number of different impact configurations. How much energy does it take to form a synestia? Giant impacts are tremendously energetic events. The energy of the event, in terms of the kinetic energy of the impact, is released over hours. The power involved is similar to the power, or luminosity, of the sun. We really cannot think of the Earth as looking anything like the Earth when you’ve just dumped the energy of the sun into this planet. We actually think that synestias should happen quite frequently during rocky planet formation. We haven’t looked at the gas giant planets. There are some different physics that happen with those. But for growing rocky bodies like the Earth, we attempted to estimate the statistics of how often there should be synestias. And for Earth-mass bodies anywhere in the universe probably, the body is a synestia at least once while it’s growing. The likelihood of making a synestia goes up as the bodies become larger. Super-Earths also should have been a synestia at some point. You say that all of the pressures and temperatures reached during planet formation are now accessible in the laboratory. First, give us a sense of the magnitude of those pressures and temperatures, and then tell us how accessing them in labs is possible. The center of the Earth is at several thousand degrees, and has hundreds of gigapascals of pressure—about 3 million times more pressure than the surface. Jupiter’s center is even hotter. The center-of-Jupiter pressures can be reached temporarily during a giant impact, as the bodies are colliding together. A giant impact and the center of Jupiter are about the limits of the pressures and temperatures reached during planet formation: so tens of thousands of degrees, and a million times the pressure of the Earth. To replicate that, we need to dump energy into our rock or mineral very quickly in order to generate a shockwave that reaches these amplitudes in pressure and temperature. We use major minerals in the Earth, or rocky planets—so we’ve studied iron, quartz, forsterite, enstatite, and different alloy compositions of those. Other people have studied the hydrogen helium mixture for Jupiter, and ices for Uranus and Neptune. In my lab we have light gas guns, essentially cannons. And, using compressed hydrogen, we can launch a metal flyer plate—literally a thin disk—to almost 8 kilometers per second. We can reach the core pressures in the Earth, but I can’t reach the range of giant impacts or the center of Jupiter in my lab. But the Sandia Z machine, which is a big capacitor that launches metal plates using a magnetic force, can reach 40 kilometers per second. And with the National Ignition Facility laser at Lawrence Livermore National Lab, we can reach the pressures at the center of Jupiter. What happens to the flyer plates when they’re shot? The target simply gets turned to dust after being vaporized and then cooling again. They’re very destructive experiments. You have to make real time measurements—of the wave itself and how fast it’s traveling—within tens of nanoseconds. That we can translate to pressure. My group has spent a lot of time developing ways to measure temperature, and to find phase boundaries. The work that led to the origin of the moon was specifically studying what it takes to vaporize Earth materials, and to determine the boiling points of rocks. We needed to know when it would be vaporized in order to calculate when something would become a synestia. How do you use your experimental results? What runs in our code is a simplified version of a planet. With our experiments we can simulate a simplified planet to infer the more complicated chemical system. Once we’ve determined the pressure-temperature of the average system, you can ask more detailed questions about the multi-component chemistry of a real planet. In the moon paper that was published this year, there’s two big sections. One that does the simplified modeling of the giant impact—it gives us the pressure-temperature range in the synestia. Then another that looks at the chemistry of the system that starts at these high pressures and temperatures and cools, but now using a more realistic model for the Earth. What was it like to get a call from the MacArthur Foundation? It did come out of the blue. They called me in my office, and I answered the phone. There were three people on the other end, and they said they were from the MacArthur Foundation. I knew what it was, and I stopped listening, because it was such a nice surprise. To me it probably is just unreal at the moment, meaning it will probably take some time to really sink in. How did you come to study planetary physics? I had enjoyed science fiction, not thinking I was going to be a scientist. But while I was in high school I had phenomenal math and physics teachers. That really grabbed my interest, so when I went to college I wanted to be a physics major. I quickly learned that the astronomers very much welcomed undergraduate researchers because the work was very accessible to someone with undergraduate skills. I met amazing scientists, and that sparked a whole career. What would you be doing if you weren’t a scientist? That’s hard. Because it has been my ideal for a very long time. In college I did a lot of theater. More theater than homework. The best theatrical experience I had was directing Sweeney Todd. It was absolutely amazing. So I did watch with some envy as some of my friends pursued a theatrical life. That is something that you can be wistful about, except that that would have been a hard path. NASA is celebrating its 60th anniversary. What does that mean to you as a scientist studying space? It feels like we’ve learned so much over 60 years, because we’ve had our first visits to everything in the solar system now. But at the same time, we’re completely surprised every time we arrive at a new object. So in some ways we’re still in the youthful period in planetary science, where we’re trying to work out basic knowledge. That’s a very exciting time. We’re still on a very big growth curve.